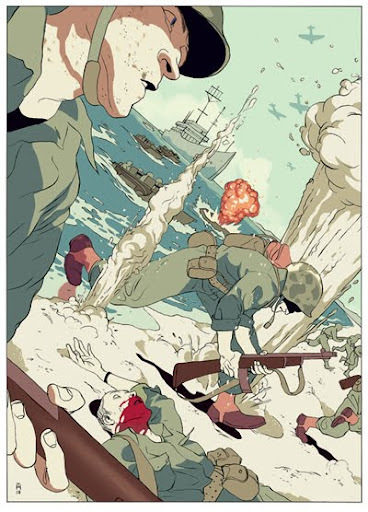 tomer :: this was done for the New Yorker's review of The Pacific, a new HBO miniseries about the United States Marine Corps's actions in the Pacific Theater of Operations. illu didn't make it to print. I kinda like the first one better. The last one comes in second. And the one in the middle comes in last. But I think the first one is more effective. Love the first too, shame it didn't see print. Really dynamic composition! Loving the second version colour scheme, adds an intense feel to whole piece. agree with loving the first one. Also enjoy that tilt in the view point wold have never thought of that. Cool. I'm partial to the yellow one. Like the red but doesn't read as easily as the other. Why on earth didn't that see print? You must have been disappointed. Anyway, my vote goes to #1 too, though it's interesting to see alternatives. Love the skewed camera angle, it makes the illo. The second one seems the most appealing to me.Composition is really dynamic, like it! thanks for the feedback... i sense a strong leaning towards the yellow, which was also my brother's favorite. the minority who liked the red is in line and the NYer's choice (before they went more photographic). personally i think the blue one works best-- it's an aesthetic invasion of a western sensibility into an Asian one, or at least that's what i was going for. Actually... by #1 I meant the first one after your comment, ie the naturally coloured one. I kind of assumed that's what everyone else meant too? There is a certain amount of confusion about the composition (quite deliberate I assume!) 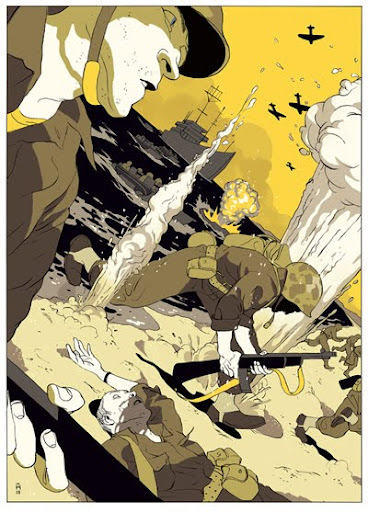 - the odd angle, the bomb blasts and the truncated bodies - and I think the illo definitely benefits from the use of a more natural colour scheme, which helps define the seperate elements. i actually prefer the third one, the yellow one coming in second. The green color scheme int he third highlights the violence in the dead soldier's blood in a way that the others don't. The yellow one makes me focus on the closest soldier, while the green makes me far more aware of the depth of field of the piece. Love em all!! Great piece. I love how the green one makes the blood pop on the dead soldier. Thanks for sharing!. Yeah I'm so surprised that no one chose the third one. That one is by far my favorite. 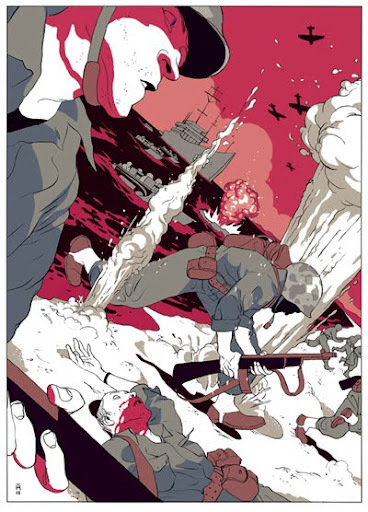 It's got those Hokusai colors but it's a heroic depiction of Americans at war with Japan. Concept aside though I just feel like I can jump into that one. It's not melodramatic (I think the first two come off that way) but it's exciting and perilous all the same, probably in part because of the great compositional choice. I might steal that idea soon... Anyway, so rad. I find the yellow most striking but the last one draws me to the blood on the soldier's face. 1 and 2 have more of a cinematic feel, a bit more removed. Love the color idea for the 3rd one but didn't quite feel it happen in the picture. the first makes me think of this n.c. wyeth painting.. I like the third version best. Maybe you can use it for another project. wowowowow def the yellow or the last one. I like the yellow best, I just like the water being black so those awesome-looking blasts read well. Real pity it didn't make it to print -- very good work - yellow one is probably most effective of the three. I prefear the third version, although the three pieces ar REALLY GOOD! i like the one in the middle it gives the effect of dark sad times just like how it was during the war in the pacfic! The 1st one looks more about the 1st guy, the 2nd is moe about the environment in the war & the last looks more about the dead guy bleeding from the mouth.